Our group is lead by Peter Boylan. He has been training in Japanese martial arts since 1986. He started in Kodokan Judo, where he has attained the rank of sandan. 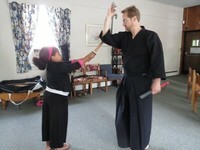 While living in Japan in the 1990s, he stumbled upon the classical Japanese martial arts of Iaido and Jodo. He began practicing Muso Jikiden Eishin Ryu Iaido with Takada Shigeo Sensei in 1993, and started learning Shinto Hatakage Ryu Iai Heiho from Kiyama Hiroshi Sensei in 1998. He is currently focusing on Shinto Hatakage Ryu Iai Heiho. While practicing these koryu arts, he has also trained in the Seitei Iaido of the All Japan Kendo Federation, reaching the rank of godan (5th degree black belt). After living in Japan for 6 1/2 years, he moved back to the USA in 1999. He returns to Japan at least once a year to train with his teachers and get advanced instruction.